Why So Many Bag Bans? If you haven’t had your head under a rock lately, you have to have seen the news about bag bans. From California to Chicago, cities and municipalities are jumping on the bandwagon and getting on board with the fact that single use plastic bags are not only bad for the environment, but a hazard to wildlife. Although Hawaii is the first state to unofficially ban single use plastic bags, California earlier this year tried, and failed, to become the first official state to ban the eco-hazards but the bans are continuing to pop up throughout the US. A quick Google search of bag bans will put you smack dab in the middle of the controversy as the plastics manufacturers are fighting tooth and nail to hang onto this lucrative part of their business model, even at the expense of our environment and our wildlife. Where Are the Bag Bans? You can find out even more about the back-story to bag bans worldwide by checking out our cool interactive bag ban map. Our map tells the stories of the various solutions to the bag ban problem throughout the world and it also offers up the solutions that municipalities have utilized. The interactive bag ban map was created by the company I am CMO for called Factory Direct Promos (FDP). We manufacture eco-friendly, custom, reusable bags for companies like Home Depot and Carnival Cruise Lines. I gotta say, I really love my job and spreading the eco-message worldwide every day is pretty awesome. At FDP, we also create other eco-friendly promotional items and of course our mission is to educate the public about the hazards of single use plastic bags. You can even share our bag ban map, and of course I hope you will, on your website or blog with an easy snippet of code. So What’s The Bad News About Single Use Plastic Bags? Consumers in the US throw away about 1 billion plastic bags a year, which is equivalent to dumping nearly 12 million barrels of oil. It is estimated that 500 billion to 1 trillion plastic bags are consumed each year worldwide – this works out to over 1 million bags per minute. 1 million sea birds and 100,000 animals such as whales, dolphins, turtles and seals die from plastic bags and other waste each year. 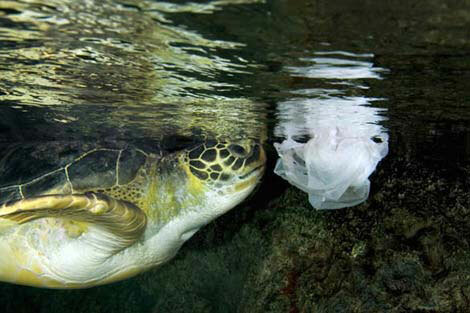 Retailers spend about $4 billion each year on plastic bags. In the United States just 8 percent of the total plastic waste generated in 2010 was recycled. It may seem that a simple solution to the eco-hazards of single use plastic bags would be to simply recycle them, but if you take a deeper look, you can see the problems. Recycling plastic bags is difficult and costly as they continuously get caught in the machinery, which requires constant repair. Additionally, you just can’t toss your single use plastic bags into the recycling bin in the garage right? You need to find a recycler and that is not always easy or convenient and folks just don’t do it. When it comes to protecting wildlife and our environment from the hazards of single use plastic bags, there really is only one solution we can all utilize and it is pretty simple. Go reusable folks. It’s that simple. The next time the cashier asks you if you want paper or plastic, just say neither. Then run back out to your car and grab your reusable bag you forgot to bring into the store. You will remember eventually and when you do, the world will be a better place because of you. It’s just that easy. 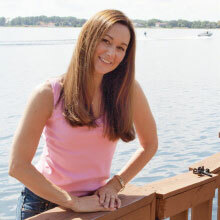 Shane Shirley-Smith is I a social media guru and specialize in the green space online and off She was selected by a Fortune 500 corporation as one of the top ten bloggers in the U.S and Canada to serve on their Blogger Advisory Board, She is a Ford Motors Digital Influencer, she lobbies for Safer Chemicals in Washington, D.C. and Florida, and she happily serves as Chief Marketing Officer for one of the largest reusable bag manufacturers in the world, FactoryDirectPromos.com. Her goal is to help consumers and companies become aware of how their choices impact their health and the health of our environment. Connect with Shane on Twitter @envirobooty or @FactoryDPromos. Thanks so much Alex for allowing me to guest post and share this important message. I hope all of the daddys here will click over to the map and take a look around. Shane where is the middle ground? ie. older person who has not purchased reusable bags. What do they do? Limited income and not willing to part with the few dollars for bags to reuse. That may be their loaf of bread or gallon of milk. So what happened to paper bags that recycle and decompose? Many stores no longer use paper bags. Take away the plastic (single use bags) and their options are nil. What would be the option they have with areas saying that they are not allowed to use the single use bags?